Inder Loves Folk Art: The Life of Birds. Lately, Joe has been very interested in birds. Not just farm birds, like chickens and ducks (although he likes those too) but all kinds of wild birds. I think this new interest is partly inspired by the walks that he and Steve have been taking around Lake Merritt this past summer. There are lots of interesting birds at the lake, beyond the usual pigeons, ducks, and geese that you would expect in an urban lake setting. Egrets. Pelicans. Herons. Cormorants. Also, all sorts of interesting ducks - for example, the Bufflehead. I am pretty ignorant about birds, but Steve knows a lot about local waterfowl. I must say, these bird names just roll off the tongue. I mean, Bufflehead! So fun to say! Between Steve and Joe, I may be converted to birding yet. To encourage Joe's new interest, Rebecca bought Joe a book about birds, and I checked out some books about birds at the library. We've also been letting him watch episodes of the PBS documentary, "The Life of Birds." Despite the rather monotone narration, Joe finds these shows absolutely riveting, and I figure, footage of real life animals in nature is a lot more wholesome than Thomas & Friends, right? So, the other day, I was sitting with Joe. I was checking my email and reading blogs, and Joe was watching an episode of "The Life of Birds" about bird parenting. Cue footage of nest full of fuzzy baby birds, watched over by solicitous bird parents. One of the more difficult aspects of being a bird parent, the narrator blandly explained, was protecting your cute little baby birdies from predators. Like owls. The next scene: a menacing owl. "Owl! Owl!" Joe squealed delightedly. Yep. In a blink of the eye, the owl flies into the air, dives down, and expertly rips one of the baby birds from its nest. A moment later, the owl is munching on said baby bird. I sat in stunned silence, watching Joe, who was carefully observing the owl chomp down the baby bird. Oh dear, have I scarred him for life? How will he make sense of this? The world can be a cruel place for baby birds ... for babies in general! I don't want Joe to be afraid! 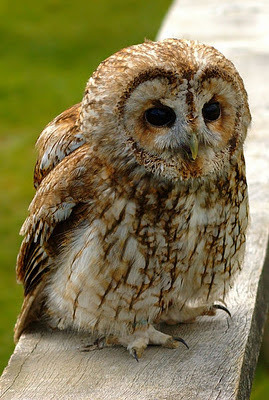 Joe pointed to the lunching owl, smiled, and declared, obviously pleased with himself, "Owl! Meat!" At which point, I cracked up. So I said the only thing I could say: "Yes, Joe, the owl is ..." [choke, sputter] " ... eating meat!" I think kids have a way of taking real nature stuff in their stride. Our boys have been watching loads of David Attenborough DVDs from a very young age. They know all about mating, ahem, but I'm not sure whether any of them has connected it to humans yet!